The fourth episode of Shadowhunters finds Clary, Jace, Alec, and Isabelle luring Magnus Bane out of hiding in order to have him help Clary locate the memories he took from her. After getting a clue about who may have wiped Clary’s memories, the crew hunts down the High Warlock of Brooklyn, Magnus Bane. With all of the warlocks in hiding from Valentine, the team must lure Magnus out with something he can’t refuse – a killer party and something very valuable. But with emotions running high, more may come out of their meeting with Magnus than just the retrieval of Clary’s memories. Meanwhile, Simon doesn’t seem to be himself after his recent Downworlder encounter. SHADOWHUNTERS – “Raising Hell” – The Shadowhunters will have to put their trust in a Downworlder to access Clary’s memories in “Raising Hell,” an all-new episode of “Shadowhunters,” airing Tuesday, February 2nd at 9:00 – 10:00 p.m., EST/PST on Freeform, the new name for ABC Family. (Freeform/Sven Frenzel) HARRY SHUM JR.
SHADOWHUNTERS – “Raising Hell” – The Shadowhunters will have to put their trust in a Downworlder to access Clary’s memories in “Raising Hell,” an all-new episode of “Shadowhunters,” airing Tuesday, February 2nd at 9:00 – 10:00 p.m., EST/PST on Freeform, the new name for ABC Family. 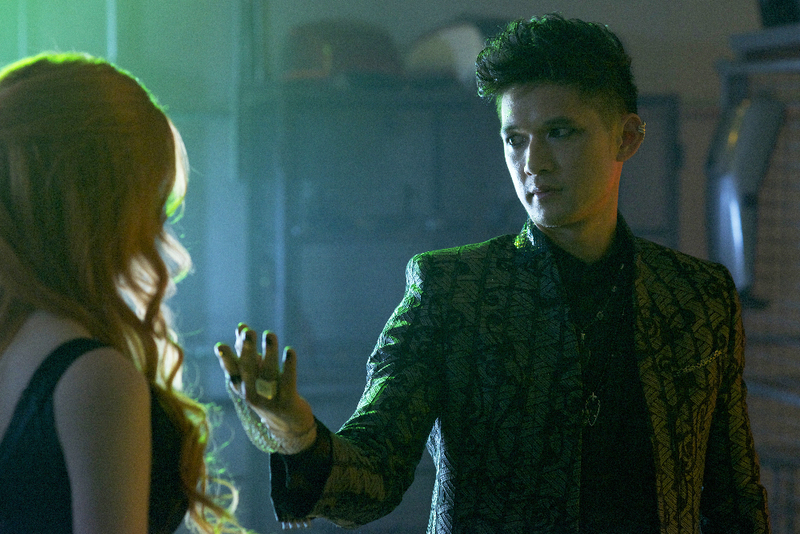 (Freeform/John Medland) HARRY SHUM JR.
SHADOWHUNTERS – “Raising Hell” – The Shadowhunters will have to put their trust in a Downworlder to access Clary’s memories in “Raising Hell,” an all-new episode of “Shadowhunters,” airing Tuesday, February 2nd at 9:00 – 10:00 p.m., EST/PST on Freeform, the new name for ABC Family. (Freeform/Sven Frenzel) KATHERINE MCNAMARA, DOMINIC SHERWOOD, HARRY SHUM JR. FINALLY, a good episode! I’m finally seeing some promise to this show!